1. 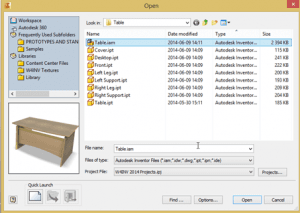 How to start Autoplot and select material replacement scheme? Open the part or assembly you want to plot. 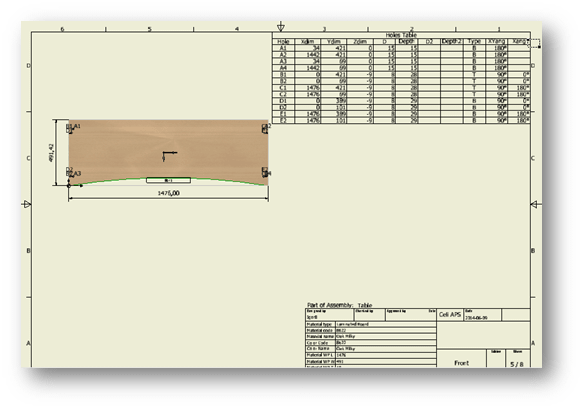 In the Woodwork Design tab, select the AutoPlot command. The AutoPlot window will appear on your screen. For annotation purposes, the Autoplot uses the same material replace schemes as those used by the Woodwork for Inventor BOM generator. 2. How to select a drawing template and the destination path for saving the drawing? The Autoplot uses specially generated drawing templates. Their default location is in the C:\Users\Public\Documents\Woodwork for Inventor\2017\V7\Auto Plot Templates. Before starting the plotting process, make sure to select the right template. Template names describe the result of their use. Now, choose a destination folder. You can do this in one of the following three ways: By using the browse “…” button. By specifying the path to the destination folder. By placing drawings in the active document’s folder. 3. How to plot a drawing (its overview)? Once the target folder is set, you can start plotting. The process can take a few minutes, depending on the complexity of your model, the selected template and your PC’s performance. At the end of the plotting process, you will see a prompt window shown below. You may open a newly created drawing or create another one. 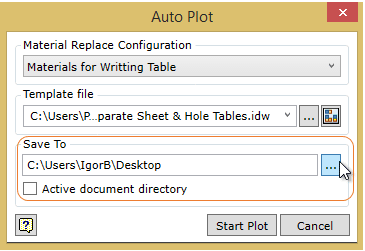 The AutoPlot result depends on the selected template. Parts can be placed so that the longest edge or grain direction is arranged in the horizontal plane. The biggest surface area of the part with the greatest number of the holes is pointed toward the user. You can also place external dimensions of a part or a workpiece and edge banding legends. The base point of the hole table is placed at the bottom left corner. Each hole has its own ID and center marks. Holes – holes of the same diameter having the same letter and a unique number (A1, A2…). Xdim and Ydim shows the offset from a base point along the X and Y axis. Z dim indicates an offset from the main face for side drilling. D2 is used to indicate a counter bore and countersink diameter. Type can indicate Blind or Throughholes. XYang – shows the angle between a hole axis and a normal vector to a XY surface. 180 degree means that the drilling vector is pointing toward the inside of the part from the top. So we can say that we start a drill from the main face site. If a hole should be drilled from the bottom, the angle between these vector would be 0 degrees. If we got a situation where the hole should be drilled from the bottom, the XYang would be 0 degrees because the drilling vector and a vector normal to the main surface would be parallel and unidirectional. Xang indicates the angle between the hole axis and the X axis. The angle is calculated counterclockwise. – 0° means drill from the left side. – 90° – from the bottom. The title block may contain the name/code of the replaced material/cover, type/dimensions of the workpiece, etc. You may include any Woodwork for Inventorproperty. 4. How to select a drawing template for modification? 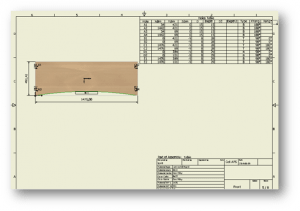 Select the Woodwork for Inventor drawing template you want to modify. You can create a copy of an existing file. Once you have set the template, you can open it for editing. 5. 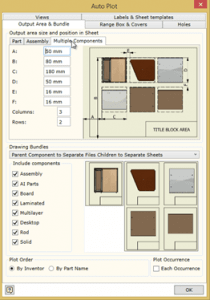 How to start the drawing template configurator (its overview)? 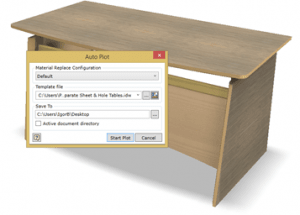 After you open the template, select the AutoPlot command from the Woodwork Design tab. 6. How to select part/assembly projections, visualization style, scale, and alignment options? In the Views tab, you may adjust the following: Number of components view projections, set Visualisation style and Scale. Separate settings are available for assemblies and parts. Additional projections can be created next to the Base View. The sides of the View Cube are used for the orientation of the assembly Base View. Also, you can set a Visualisation Style and Scale. The Scale can be set to static or automatic. The AutoScale automatically adjusts the scale so that the view of the component is maximised to fit the output area controlled with the Output Area & Bundle tab. For parts besides the above-mentioned settings, you can additionally set Base view alignment options. The parts can be aligned horizontally along the longest edge or grain direction. You can set the gaps between the Base View and projections for both parts and assemblies. 7. How to set the formation type of the drawing bundle? In the Output Area & Bundle tab you can select view arrangement, set the type of a drawing bundle and include/exclude components by type. 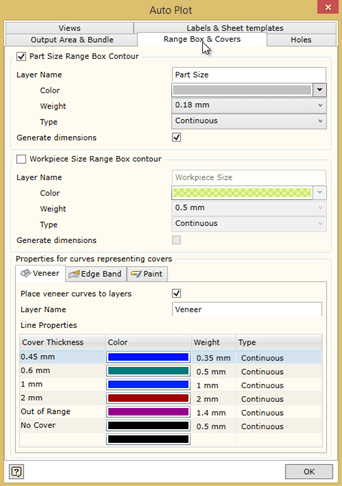 The Output areas size and position tab controls component view options. You can use individual settings for different components. For parts and assemblies, you can select a distance (A;B) from the bottom left corner; you can also specify the size of the output area (C;D). For multiple component output, you can set the area for each component (C;D); the gaps between the views in the horizontal (E) plane and vertical (F) plane and the number of columns and rows. The drawing bundle settings control the drawing visualisation style. You can place each component in a separate file. Or place each component on a separate sheet. Multiple components can be placed on the same sheet. An assembly can be placed in a separate file and its components can be placed on the separate sheets of the same drawing. You can place an assembly in a separate file and its components (based on the number per sheet selected) on separate sheets. 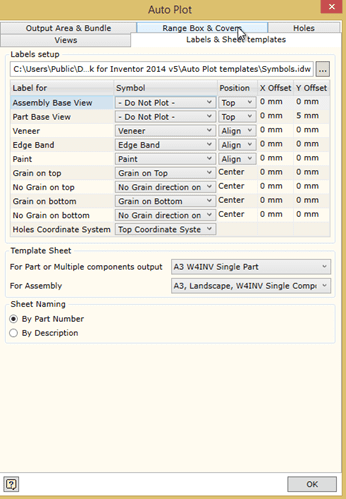 You can place an assembly on a separate drawing sheet and its components (based on the number per sheet selected) on separate sheets. Include/exclude components by their type. 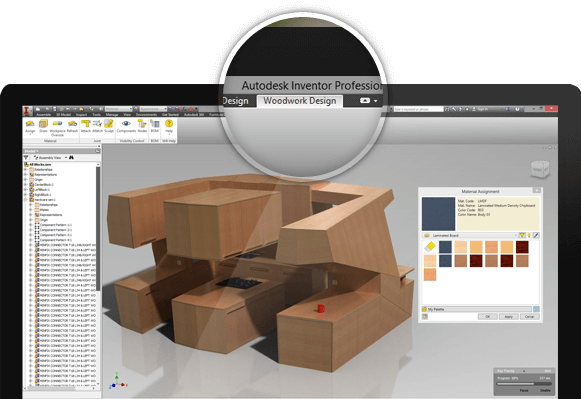 You can print components in the same order as in the Autodesk Inventor Browser or arrange by Part name. By default, only one occurrence of the component is plotted. However, you can ignore this rule and plot each occurrence. 8. How to select annotation symbols and sheet formats? Using this path, you can set your own custom Sketched Symbols for drawing annotations. 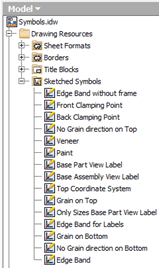 After you have assigned the symbol file, you can use the symbols contained in it for indicating covers (paint, veneer, edge bands, etc.). Also, you can control grain direction, base point and other indicators. Once you have assigned the symbol, you can specify its position. Positioning options depend on the annotation type. You can position them top, bottom, left, right, or center. Cover annotations may be placed on the edge or at a certain distance from it. 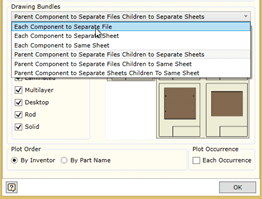 You can select a different sheet format for the placement options of parts/assemblies/multiple components on one sheet. 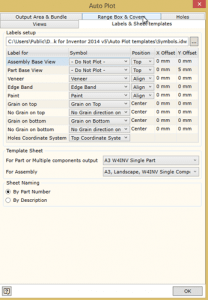 Also, you can select sheet naming scheme by part number field or description field. 9. How to select output dimension options for parts/workpieces, line types, weights, colors, etc? In the Range Box & Covers tab, you can select line type for different covers and for different dimensions of parts/workpieces. Using the Range Box & Covers you can select the line type for Part and Workpiece range box. You can choose a line type, thickness, color, etc. For different objects you can use individual settings. 10. 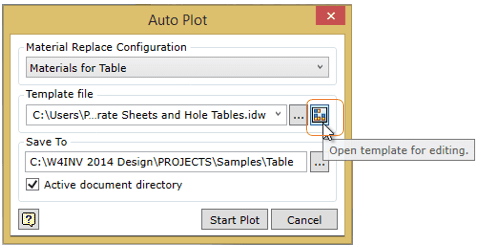 How to select a hole annotation scheme and set the position of the hole table in the drawing? The Holes tab is used to configure the hole scheme. Through/Blind holes, Countersinks/Counterbores can have different annotation schemes. Ø THRU will provide the following result: Ø 8 THRU 4 This means, that four through holes will be drilled using a 8mm drill. The base point of the coordinate system can be placed on the bottom left hand corner of the part or workpiece rectangular range box. The hole table can be offset from the lower left corner. The hole table can be placed automatically while creating a drawing. 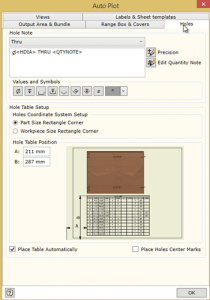 To automatically place hole centermarks and the hole table, select appropriate settings. Now you can save the file or its copy with a new name and use it as an adapted template. play_circle_filled 1. 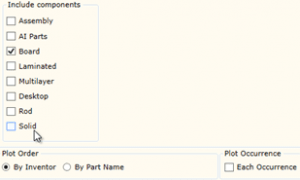 How to start Autoplot and select material replacement scheme? play_circle_filled 2. How to select a drawing template and the destination path for saving the drawing? play_circle_filled 3. How to plot a drawing (its overview)? play_circle_filled 4. How to select a drawing template for modification? play_circle_filled 5. 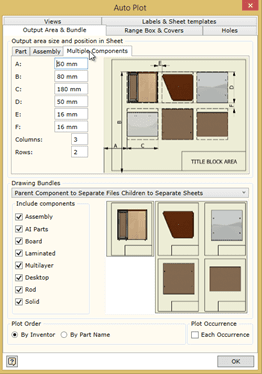 How to start the drawing template configurator (its overview)? play_circle_filled 6. How to select part/assembly projections, visualization style, scale, and alignment options? play_circle_filled 7. How to set the formation type of the drawing bundle? play_circle_filled 8. How to select annotation symbols and sheet formats? play_circle_filled 9. How to select output dimension options for parts/workpieces, line types, weights, colors, etc? play_circle_filled 10. How to select a hole annotation scheme and set the position of the hole table in the drawing?